Category: Charity work, Extra Stuff, special promotions, what's going on this month? October is breast cancer awareness month. So to honour those who have fought or will fight breast cancer, and to spread the word about breast cancer awareness, we’re all going to have some fun. Do you want a special October treat? Do you want to help support breast cancer research? To do both, all you have to do it put on something pink (the wackier, the better! ), take a selfie (or get a friend or stranger to take it), and then head over to the FB page Here and post your pink wearing selfie. Once you do, I’ll mail you a special gift certificate and donate $1 to breast cancer research. Gaia Magick Photography supports showing your boobies love. One of the ways to do this is to regularly do your own self breast exams and to schedule regular mammograms. You can go here to create your Early Detection Plan, or download the app (Apple and Android). I downloaded the app: it’s easy and has all the information and planning tools you need. Very cool! And now I have an early detection plan. 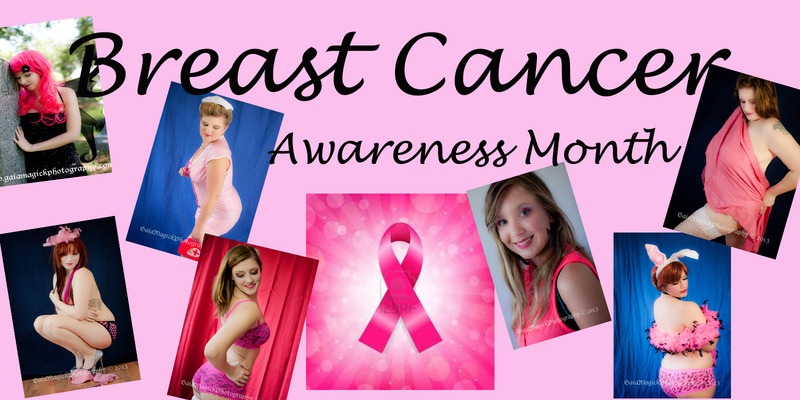 You can get more information about breast cancer awareness month here. Wanna show your boobies even more love? Get ’em photographed! The October bring a friend special is the perfect time to grab a friend and plan a girls days in. It’s a great way to spend an afternoon, to honour your boobies and bodies, and to create some amazing memories that will keep you smiling throughout the stressful holiday season. If you want to chat about your boobies or need some support with your body image please use the ways below to get in contact with me. Do you need a little more information about sessions or perhaps, help coming up with a creative inspiration that truly brings out your inner goddess, please contact me though any of the channels below. I’d love to chat with you!